Research conducted since the end of WWII into the causes of hypertension and coronary heart disease has identified a number of important risk factors that contribute to the development of these illnesses such as excessive caloric and fat intake leading to obesity and elevated blood cholesterol, cigarette smoking, high blood pressure, and diabetes, all of which contribute to atherosclerosis. Unfortunately, the cause(s) of high blood pressure have proven more difficult to identify, though being overweight has long been recognized as a risk factor for hypertension. Recently, attention has focused on the workplace as a potential source of stressors that might contribute to the development of hypertension. A number of specific stressful working conditions, such as repetitive work, assembly-line work, electronic monitoring or surveillance, involuntary overtime, piece-rate work, inflexible hours, arbitrary supervision, and deskilled work, have been studied. Over the last 15 years, a new model of job stress (see figure) developed by Robert Karasek has highlighted two key elements of these stressors, and has been supported by a growing body of evidence. 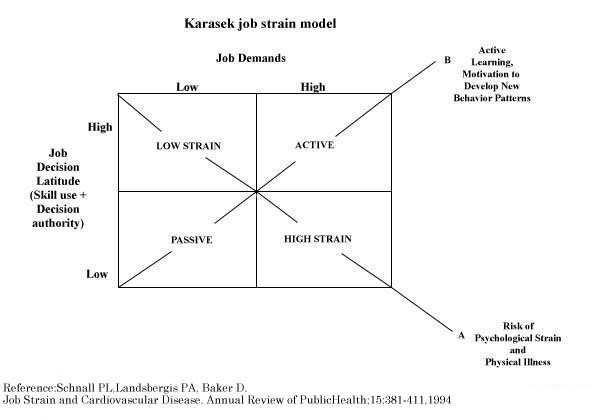 Karasek’s “job strain” model states that the greatest risk to physical and mental health from stress occurs to workers facing high psychological workload demands or pressures combined with low control or decision latitude in meeting those demands. Job demands are defined by questions such as “working very fast,” “working very hard,” and not “enough time to get the job done.” Job decision latitude is defined as both the ability to use skills on the job and the decision-making authority available to the worker. In some recent studies, this model was expanded to include a third factor – the beneficial effects of workplace social support. While there are a variety of models of “job stress,” the “job strain” model emphasizes the inter-action between demands and control in causing stress, and objective constraints on action in the work environment, rather than individual perceptions or “person-environment fit.” Karasek’s model emphasizes another major negative consequence of work organization;: how the assembly&SHY;line and the principles of Taylorism, with its focus on reducing workers’ skills and influence, can produce passivity, learned helplessness, and lack of participation (at work, and in the community, and in politics). The “job strain” model (see figure) has two components – increasing risk of heart disease following arrow A, but increasing activity, participation, self- esteem, motivation to learn, and sense of accomplishment following arrow B. Thus, this model provides a justification and a public health foundation for efforts to achieve greater worker autonomy as well as increased workplace democracy. Considerable evidence exists linking “‘job strain’” to hypertension and coronary heart disease. Over the last decade more than 40 studies on “job strain” and heart disease and 20 studies on “job strain” and heart disease risk factors have been published throughout the world providing strong evidence that “job strain” is a risk factor for heart disease1. Of the eight studies where an ambulatory (portable) blood pressure monitor was worn during a work day, five showed strong positive associations between “job strain” and blood pressure, while three others provided mixed results. Since Because ambulatory blood pressure is both more reliable (since there is no observer bias and the number of readings is greatly increased) and more valid (since blood pressure is measured during a person’s normal daily activities including work) than casual measures of blood pressure, we feel confident in placing more emphasis on the ambulatory blood pressure results. The issue of job stress is of utmost importance to the public health community and working people. The economic costs of job stress in general (absenteeism, lost productivity) are difficult to estimate but could be as high as several hundred -billion dollars/ per year (2, p. 167-8). Most importantly, there is the potential for preventing much illness and death. More than 50 million Americans have high blood pressure, and, in 95% percent of cases, the cause is unknown. While estimates of the proportion of heart disease possibly due to “job strain” vary greatly between studies, Karasek and Theorell (5, p. 167) calculate that up to 23% percent of heart disease could potentially be prevented (over 150,000 deaths prevented per year in the U.S.) if we reduced the level of “job strain” in jobs with the worst strain levels to the average of other occupations. 1 Schnall PL, Landsbergis PA, Baker D. Job Strain and Cardiovascular Disease. Annual Review of Public Health; 15:381-411,1994.Schnall PL, Landsbergis PA, Schwartz JE, Pickering TG. Job Strain and Hypertension. Do You Have Job Strain? This test can give you a rough indication of how much ‘job strain’ you’re may have at work. The reference for the following graphic is: Landsbergis PA, Schnall PL, Schwartz JE, Pickering TG, Warren K. The association of ambulatory blood pressure with alternative forms of job strain. Scand J Work Env Health; 20:349-63,1994. Quadrant formed by dichotomizing latitude and demands scores at the medians of the current sample (latitude <74 and demands >32). Area formed by using national (U.S. QES) means for latitude and demands (latitude <72.6 and demands>30.6 for males: latitude <65.7 and demands > 31.3 for females). Sample demands divided by latitude. This continuous form of the variable can be dichotomized at an arbitrary cutpoint. Linear function created by y=(b) demands-(c) latitude. (If both variables are on the same scale, y=(0.5) demands – (0.5) latitude.) This continuous form of the variable can be dichotomized at an arbitrary cutpoint. 1) for the job strain quadrant term based on Cornell sample medians, use latitude <37 and demands >32. 2) for the job strain quadrant term using national means, use latitude <36.3 and demands >30.6 for males; latitude <32.9 and demands >31.3 for females. Robert Karasek originally developed and provided evidence the “job strain” concept and model. Karasek, writing in 1979, argues that work stress and the resulting physical and mental health effects of work stress, result “not from a single aspect of the work environment, but from the joint effects of the demands of a work situation and the range of decision-making freedom (discretion) available to the worker facing those demands… Job strain occurs when job demands are high and job decision latitude is low” (52, p. 287). The “job strain” model (see Figure 1) states that the combination of high job demands and low job decision latitude will lead to negative physical health outcomes such as hypertension and cardiovascular disease (CVD). In addition, the model contains important predictions regarding the socialization of personality traits and behavior patterns which occurs at work. Chronic adaptation to low control-low demand situations (“passive” jobs in Figure 1) can result in reduced ability to solve problems or tackle challenges, and feelings of depression, or “learned helplessness” (58). Conversely, when high job demands are matched with greater authority and skill use (controllable stressors, or “active” jobs), more active learning and greater internal locus of control develop. This can enable individuals to develop a broader range of coping strategies. The discussion below of formulations of the “job strain” concept will primarily focus on studies of negative physical health outcomes, which have been more thoroughly reviewed. In order to operationalize the interaction between job demands and job decision latitude that creates “job strain”, the most common procedure in CVD research studies has been to create a dichotomous (“yes”/”no”) “job strain” variable (also called the job strain “quadrant” definition — see Figures 2a and 2b). Study participants are classified as having “job strain” (or “high strain” jobs) if they are above the median or mean on demands and also below the median or mean on decision latitude. Such employees may be identified by dichotomizing self-reports of demands and latitude at either the medians or means of the study sample (Figure 2a) or reference samples such as a national sample (Figure 2b). A newer approach, used in seven CVD studies with positive results (32, 108-110, 114, 115, Landsbergis et al., 1994) has been to create a continuous independent variable — demands divided by latitude (figure 2c). This measure can then be dichotomized at an arbitrary cutpoint. Since this quotient term is non-linear, and tends to give more weight to latitude (the denominator) than demands, a similar continuous (but linear) formulation has been proposed in which the contributions of low latitude and high demands are equally weighted (figure 2d) The linear formulation, essentially demands minus latitude, can then also be dichotomized at an arbitrary cutpoint. In one other study with positive associations between “job strain” and heart disease (59), a similar formulation was used to isolate 20% of the sample as “high strain”. The “high strain” group was defined as (demands + 1) x (latitude – 1) < -1.2, where demands and latitude are standardized scores. In six CVD studies (19, 37, 49, 90, 93, Landsbergis et al., 1994), a multiplicative interaction term partialled for main effects (demands x latitude, controlling for demands and latitude) was used. However, in only three of those studies (37, 49, Landsbergis et al., 1994) did the interaction term significantly improve the variance explained by the model beyond what could be obtained with only the main effects. Exploratory graphical approaches have been used (49, 54, Landsbergis et al., 1994) to examine interaction effects and thresholds (non-linear effects). For example, demands and latitude have been divided into tertiles or quartiles, and patterns of heart disease risk or blood pressure elevation examined across the resulting nine (49, Landsbergis et al., 1994) or 16 (54) exposure cells. A number of CVD studies have examined the main effects of job demands and job decision latitude on risk of illness rather than their interaction. Nineteen (4, 8, 19, 30, 36-38, 49, 53-55, 59, 68, 69, 81, 90, 110, Johansson et al., 1991; Alterman et al., 1994) of 31 studies that examined main effects found some significant associations between job decision latitude and outcome. However, associations between job demands and outcome were significant in only nine (6, 30, 37, 49, 54, 55, 59, Johansson et al., 1991) of 29 studies. The “job strain” model was not designed to replace the earlier more complex person-environment model of occupational stress originating from the University of Michigan (16, 42) or the recent refinement of the Michigan model by the National Institute for Occupational Safety and Health (NIOSH) (44). The Michigan model incorporates: both perceived and objective stressors; the potential moderating effects of social support, personality factors, non-work factors, and demographic measures; feedback loops; and a wide variety of outcome measures. Issues of self-reported vs. objective job characteristics and effect modification are, of course, also important issues for the “job strain” model. However, the “job strain” model, in contrast to the Michigan model, emphasizes the need to distinguish features of the work environment that can be categorized as demands or control (and does not simply list all job factors as potential stressors), examines the interaction between demands and control, and emphasizes the stress-producing properties of these objective factors, and not solely individual perceptions, or person-environment fit. Alterman T, Shekelle RB, Vernon SW, Burau KD. Decision latitude, psychological demand, job strain and coronary heart disease in the Western Electric Study. American Journal of Epidemiology 1994;139:620-7. Ganster DC. Worker control and well-being: A review of research in the workplace. In Job Control and Worker Health, eds. SL Sauter, JJ Hurrell, CL Cooper. New York: Wiley, 1989;3-23. Hall EM, Johnson JV, Tsou T-S. Women, occupation, and risk of cardiovascular morbidity and mortality. Occupational Medicine: State of the Art Reviews 1993;8:709-19. Johansson G, Johnson JV, Hall EM. Smoking and sedentary behavior as related to work organization. Soc Sci Med 1991;32:837-846. Karasek RA. Control in the workplace and its health-related aspects. In Job Control and Worker Health, eds. SL Sauter, JJ Hurrell, CL Cooper. New York: Wiley, 1989;129-159. Landsbergis PA, Schnall PL, Warren K, Pickering TG, Schwartz JE: Association between ambulatory blood pressure and alternative formulations of job strain. Scand J Work Environ Health 1994;20:349-363.